The explosive growth of tablets in mainstream consumer computing has made a broad range of specialized, embedded applications possible. However, customizing consumer hardware such as Apple's iPad or Amazon's Kindle Fire can pose a development and supply chain challenge, especially for embedded, tablet-based applications requiring rapid deployment. Liquidware (http://www.liquidware.com), an innovator in rapid engineering for embedded applications, today announced the retail availability of Amber, the first customizable, off-the-shelf tablet, for accelerated development, integration and deployment of custom Android hardware applications. Trying to customize mainstream consumer tablets like Apple's iPad or the Samsung Galaxy is still problematic as third-party developers have little or no control of the underlying hardware or supply chain. Liquidware, an innovator in rapid engineering for embedded applications, today announced the retail availability of Amber, the first customizable, off-the-shelf tablet, for accelerated development, integration and deployment of custom Android hardware applications. Liquidware Amber is designed specifically for speed, from concept through to deployed product. Engineers who need to rapidly integrate Android tablet capabilities into custom designs can reduce development time and cost, while companies can capture new markets and realize faster product revenues. Liquidware Amber is a ready-to-customize, multi-touch, capacitive tablet equipped with Android Gingerbread, and with Ice Cream Sandwich available soon. Powered by Texas Instrument's OMAP family of powerful ARM-Cortex A8 processors, Amber combines high-performance embedded computing with an easily-integrated USB and serial interface tailored specifically to accelerate embedded product development and deployment. "Many companies are still sinking significant engineering investment into designing custom Android tablet interfaces from scratch, but there's a huge risk that the marketplace has completely changed by the time they deploy, and they already face an uphill battle at launch" says Justin Huynh, Director of Product Development at Liquidware. "Trying to customize mainstream consumer tablets like Apple's iPad or the Samsung Galaxy is still problematic as third-party developers have little or no control of the underlying hardware or supply chain. Liquidware’s Amber Android Development Framework built around an easily customizable Android tablet eliminates the speed, budget, and lifecycle issues facing long-tail embedded product development teams today." The growth of high-capacity, ubiquitous bandwidth and concentrated processing power in the cloud places increasing emphasis on the role of mobile, thin clients in the network. With the need for media-rich interactions and "computing anywhere", always-connected tablets are taking the place of laptops and desktops. Tablet-centric computing creates a completely different development landscape. While software development has evolved code bases, accessible stacks, and other consolidated toolchains and libraries, hardware capabilities have only recently started to make progress, with system-on-modules and single-board computers. But the majority of hardware development systems still focuses on basic chipset functionality, leading to expensive and impractical development boards, or relies on unsustainable and extensive modification of consumer devices, such as Apple's iPad or Amazon's Kindle Fire. While mobile application marketplaces, such as the Apple App Store, and the Android Market experience explosive growth, tablet hardware is largely constrained to standard mainstream consumer offerings, limiting tablet integration potential in extensive new markets. 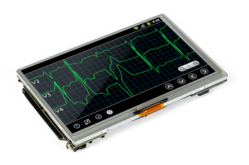 Just as tablets have made their way into the consumer and enterprise markets, they also have extensive potential uses in a wide range of customized, embedded devices. Advertising platforms, retail engagement interfaces, information kiosks, factory automation, transportation systems, warfighter information systems, medical devices and many others can all be transformed by tablet technology. But many of these new markets require hardware customization for tablets to be effective. With Android tablets now deploying into embedded applications, the need for a totally customizable tablet and rapid development framework is critical. Liquidware’s Amber fills this need and delivers a rapid, competitive Android development framework for capitalizing on new market opportunities, enabling new designs to get to market sooner. Liquidware Amber is now available to order at http://www.liquidware.com. Liquidware (http://www.liquidware.com) is one of the fastest growing engineering firms in North America, specializing in high speed, lower power, embedded systems product design and rapid prototyping for a variety of markets, including medical devices, parallel systems, and defense engineering. Liquidware’s capabilities include technology advisory services, all aspects of design, development and procurement, and short run and volume manufacturing. Liquidware’s hardware has been used by some of the world’s leading research institutions and consumer product firms, and is deployed in field operations worldwide. Liquidware, Amber are trademarks of Liquidware, Inc. OMAP is a trademark of Texas Instruments. ARM is a trademark of ARM Limited. All other trademarks and registered trademarks are the property of their respective owners.